AN 18-year-old Lismore man who lost control of a Ford Falcon utility before slamming into another car at Clunes yesterday returned a positive roadside breath test. He was taken to Lismore Base Hospital where alcohol blood tests were expected to be carried out. The Falcon completed a full 360 degree turn before crashing into a Toyota Camry in which three people were travelling, approximately 1.5km east of Clunes. A third vehicle, a Mazda Bravo, clipped the Camry while trying to avoid the crash. 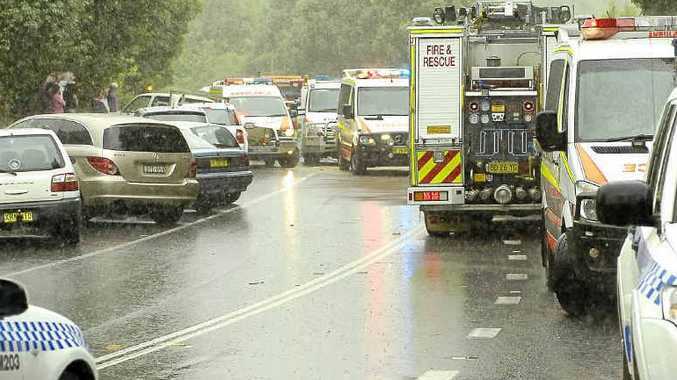 Five people were injured and traffic along Bangalow Rd, south of Clunes, was backed up for several kilometres while rescue crews cut the occupants out of the Camry, which was being driven by a woman from Western Australia. Two women sustained minor back injuries and a third woman suffered more serious internal injuries, a Police representative said. Two men from the Falcon received injuries including lacerations. Lismore Rd was closed for an hour while rescue teams worked in torrential rain. A police rescue unit from Lismore, the Clunes Rural Fire Service, Lismore Fire and Rescue Services and officers from the Tweed-Byron Local Area Command attended.